As a video game critic very much invested in the [coughing, cringing]. . . professional discourse, I've found the Dark Souls games weirdly echoic. I play one, I know I'll reliably find myself repeating the same battles over and over again; I know the few predecessors of mine who've stuck around will offer only scant, sardonic advice, having resolved to lean-in to futility. It might as well be any given weekday on games crit Twitter. 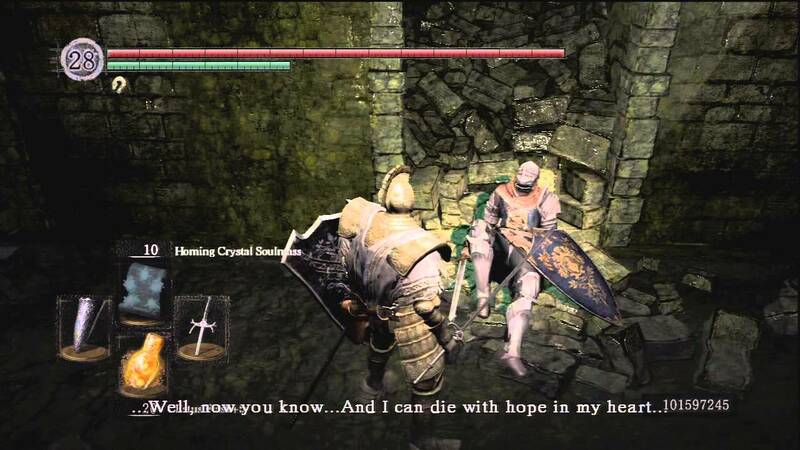 And if I were looking for an affirmation of all my bleak social media questing, maybe I could find one in Dark Souls. If not necessarily for the auspices, then at least the tragic nobility of it all. 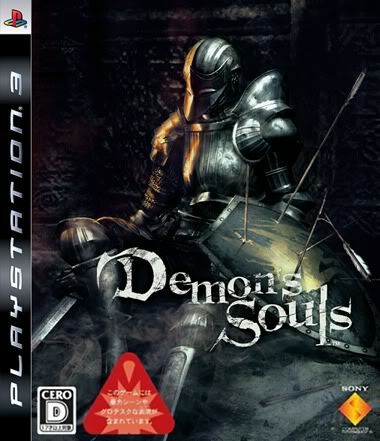 The "Souls" games' de facto mascot is a knight-errant in some stage of defeat, and maybe best embodied by the very first character met in the first Dark Souls: Oscar of Astora, found dying in the introductory dungeon (even more fittingly, the only reason his name is known at all is because it was discovered, unused, in bowels of the game's code—for the purposes of most players he remains nameless). After five games' worth of fatalistic motif, I've come to see Oscar as representing a possible, even canonical ending for the player. To try and be found wanting. To fall somewhere along the path, a play-through frozen in time like one of those corpses on Everest—one more bit of set dressing for Dark Souls: A Very Hard Video Game. There is another type of player, though. As those others languish on the battlements, these ones are back-flipping off, lapping them on fourth or fifth runs though the game, so competent and self-assured that they sometimes actually heap extrachallenges onto their plate—beating the game without leveling up, say, or with a Rock Band guitar controller. Dark Souls 3 is for these folks. Was always going to be for them, really—the most passionately invested, the most vocal, the hardiest and most likely to still be around after all these games. That's just the way these things go. Sequelization is selective breeding; the enthusiast has the desired gene. Somebody has to be buying the t-shirts. There's a bit of folk wisdom that goes: whichever Souls game you play first, that'll be the one that ultimately endures as your favorite. Whether it always bears out that way or not, there's a truth underpinning the theory. That the subtle thrill of one's first Souls game is actually in learning how to learn to play it—in the fits and starts of the body's struggle to accept its idiosyncratic instruction. It took me years of sporadic play to finish Demon's and Dark Souls, games I viscerally rejected, only to frantically scrounge up again months later. Those interstitial moments were always pregnant with micro-revelations. I'd wake up in the middle of the night, suddenly able to see the hollow of safety beneath a boss's arcing blade, or the grammar of a trap in a treasure chest's position within a hallway. There's a whiff of the quasi-religious there, and to be sure, the Souls game community has kind of always been enamored of dogma. Praiseth the sun. Useth not the Drake Sword, for it is a crutch. Go unto thine first play-through blind, and readest not the wiki. I do get that. Boletaria, Lordran...they feel like works of the creator from the watchmaker theory, who assembled the world and then decamped for good. You can practically hear the clockwork mechanisms whirring away behind the helmets of the black knights, or in the cuckoo-clock dragons who circle their bridges to spew fire. Every piece appears purposeful, sustained..."Intelligently Designed," even. It's a mandate that stretches back at least as far as the Armored Core series (I’ve never played Kings Field), and the way From always ensured that the badass mechs from the games' introductory shorts were assembled from the same basic list of parts that both the player and the game’s enemies also sourced. Similarly, it’s always been possible to complete Souls games with whatever gear you walk in with. Leveling up can grease the wheels, but the games’ scaling is such that enemies never make insurmountable gains on the player in terms of raw stats, regardless. Instead, it's unfamiliarity that traditionally acts as the game's friction, braking the player until they reach the desired speed. The games' first enemies tend to be shambling humanoids, with graciously telegraphed attack movements. But further in, the player experiences a narrowing of attack and defense windows, a new subtlety in the tells. At the furthest end of that spectrum—the peak unfamiliar and thus the most dangerous—are invading human players, armed with abstract thought, and just coming into their esoteric magics and novelty builds as the games reach their final chapters. The joy of a Souls game, as any fan will tell you, is in worrying away at these finicky encounters until the body learns to start metabolizing them—to convert the unfamiliar into the familiar. Are we all familiar now? Dark Souls 3, at least, presumes that we are. It cuts right to the chase. Where earlier Souls games were understated, Dark Souls 3 is curt. "Welcome back to Firelink Shrine," it seems to say, already walking away, gesturing brusquely, “—you know the deal, bathroom’s down the hall and to the left; blacksmith’s on the right.” Good news for our aforementioned enthusiasts, who get to go right to demonstrating their hard-earned mastery. Bad news for the doomed Oscars, whose presence feels increasingly unaccounted for. I managed, myself, after a fashion (trips to the wiki, liberal summoning of other players to assist, zero compulsion against running away from anything scary). Beating Dark Souls 3 felt uncharacteristically imperative. Lothric just doesn’t feel like a resting place. It exists to be beaten—for a game where the player character begins their journey by rising from a coffin, death and failure don't really carry the weight of meaning, here. One non-playable character who resided in the home shrine, a sorcerer named Yoel of Londor, died where he stood at some point while I was afield, to almost no fanfare. The body stayed there for the rest of the game. At some point, a replacement NPC simply set up shop next to the corpse. If she had any reservations about it, I wouldn't know—she exhausted the entirety of her dialogue after a couple of lines. Brendan Keogh, remarking on the sense of timelessness that pervades in the original Dark Souls, said that “a knight sits contently in front of a giant gate, waiting for it to open. You can’t help but think he has been sitting there since before time began.” And yes, those selfsame knights do still sit and wait in front of their gates in Dark Souls 3. Lothric is Lordran, or at least Lordran adjacent, or something. . . the already fuzzy chronology gets fuzzier here, as stories and lands sublimate into a familiar, all-encompassing narrative about rekindling the world's flame. The characters the player encounters just have less to say this time around, quickly stonewalling any conversation with a repeated lines of dialogue. That is, if you can even find them (by the end of my first play-through, my Firelink Shrine remained depressingly lifeless). One more point for the enthusiasts, there: they're better equipped to bird-dog the NPCs and track down their obscure quests. Me, though, I even lost track of Dark Souls 3's version of the Crestfallen Warrior. And I really like the Crestfallen Warrior (file under: the tragic nobility of games crit twitter). There's a take on Dark Souls’ Siegmeyer, here Siegward of Catarina. There’s a smirking betrayer, and a seated crone, and more—each, like many of the locations, a nod to an encounter from an earlier game. Even pieces of Bloodborne manage to make their way into Dark Souls 3, something I’d noticed in one early stage when I approached a gathering of gangly, torch-and-pitchfork-wielding villagers around a pyre. As one critic noted in a piece I've since lost track of, some graphical assets are literally cribbed from Bloodborne. I'll call that fitting, though, for a game that's undeniably interested in final pilgrimages—even the assets seem to be making their last Hajj. Those antecedent designs have since become iconic, meaning (obviously) that they’re icons: symbols carrying condensed meaning, and ones that Dark Souls 3 deploys immediately. They're like a shared cipher that in-the-know players can open and say “Ah, see, when the first three letters of the first word begin thusly, it means that it's actually about this.” I'm not conversant, but I can attempt a translation. Dark Souls 3 is about the decline and death of old worlds. That part's easy enough—the game features a jaunt through the Demon Ruins from Dark Souls, and all the old enemies lie dead in the halls. A surprise return to Anor Londo, perhaps the most widely loved setting in all of the games, is similarly dampened by melancholy and loss. 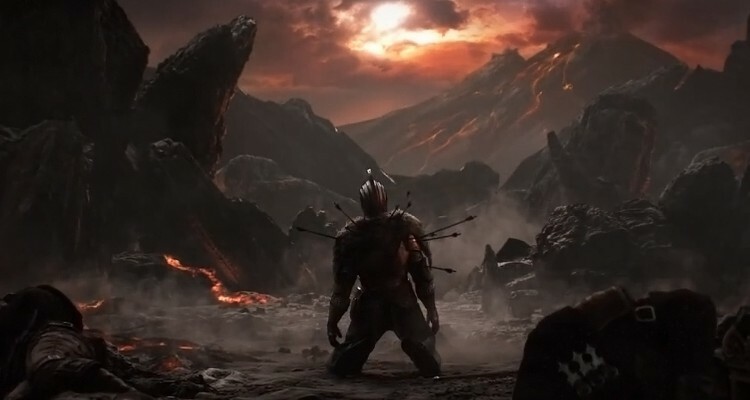 But for all the literal ways in which things are reduced from grandeur in Dark Souls 3, nothing puts so fine a point on it as a rematch with the infamous Anor Londo archers, who once almost singlehandedly put me off the original Dark Souls for good. There are even more of them this time around, tactically spaced along their buttresses, ready to knock you to your death. No matter—this time I punted them all off the side on my first try. After just a few weeks away from Dark Souls 3, I noticed something strange: I was having a difficult time recalling wide swathes of my time with it. I’d think I had remembered a segment, only to realize that I was suffering a bit of bleed-in from one of the other, previous games. I pulled up a Let’s Play of the game on Youtube at some point, and had to think to myself “That’s right…I did do this. I was there.” This was about something more than Dark Souls 3’s self-references, more than nostalgia, more than a matter of a few characters and places being dredged up and tilted slightly off-kilter. There are a few parts that stand out in my memory. The Dancer, a lithe, stalking boss that took me by complete surprised and swindled me out of a hundred thousand of my saved-up souls. Or the twinkling approach to Irithyll of the Boreal Valley, which holds the eye just long enough that you don’t notice the giant horrorbeast that comes up on you from behind on the bridge over. Aldrich, Devourer of Gods, may be the most interesting of the bunch, despite the fact that his actual battle wasn’t much of a challenge for my no-frills knight “of little renown.” In a morbid bit of extra-textual metaphor, Aldrich, a religious zealot, dreams of cannibalizing the old bosses of the previous games. He eats Dark Sun Gwyndolin, who thus subsumed, becomes a portion of the boss. That grisly lore reminds me of the Souls games’ unique “second death” state: what’s called “going hollow.” I always found the choice of words interesting. “Hollow,” as though there were a void inside of the characters that wants filling, some kind of gnawing hunger that pushes them to attack. It makes me think about the enthusiast player, too—the hyperconsumer, insatiably gobbling up these Souls games as fast as they can turn them out. Limp to the end of the game, as I did, without having performed the abstruse side tasks needed for one of the more robust endings, and you get an almost comically subdued epilogue. The player character touches the sacred flame (an all-consuming conflagration sort of thing in previous games), mutely self-immolates, and just sort of has a bit of a sit. The message seems to be: you can't keep dipping back into the well; returns inevitably to diminish. Completionists find a different, more dramatic ending, of course—hard to imagine them settling for something so stark after the amount of effort they’ve put in. But more interestingly, there's a third ending. The only players who see it will be a special, "Devil's Cut" reserve of completionists. They have to fulfill all the previous requirements, and then undertake an action they'd surely have to look up online to know it was even a possibility. If the player uses a fraction of a second between cutscenes for one last attack, there’s a different accounting. In this ending, the player kills the benign Keeper of the Fire, architect of their quest. The Fire Keeper, if you didn't know, is the provider of level-ups, of the player's incrementally growing strength. They're the goose that lays the golden egg, and in this ending, the player slays them in the hope for more. I see that and think: Dark Souls, as a franchise, as an idea—whatever you will. . . it was never going to outrun this breed of enthusiast. That the only thing it could do is turn around and face them, back towards where it came from, to the scorched earth and corpses of hundreds of thousands of play-throughs, and let itself be easily digested. There would be something tragically noble, something quintessentially Dark Souls, about that.